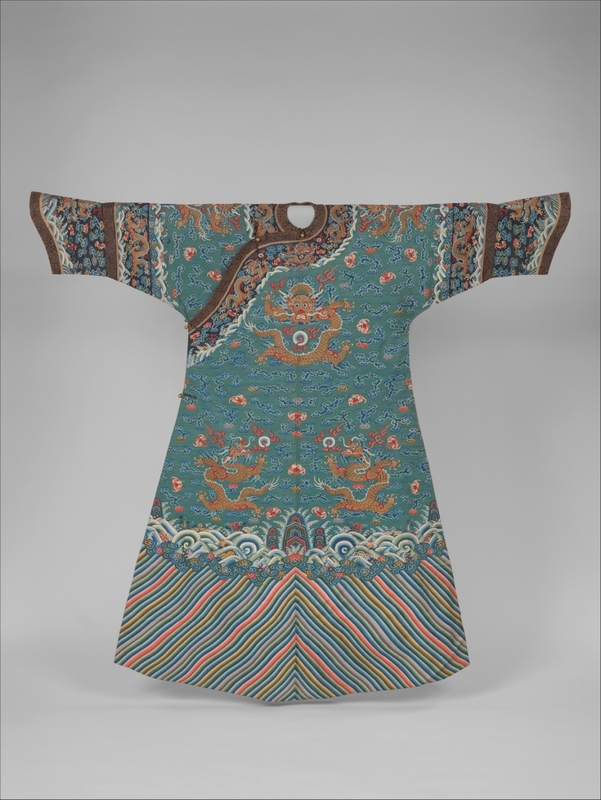 Nearly all of the early collections of Chinese dress and textiles in North American museums ultimately are traced to the Beijing art market. This continuing series highlights some of the personalities involved with the movement of Ming (1368-1644) and Qing dynasty (1644-1911) artifacts from China to the West. 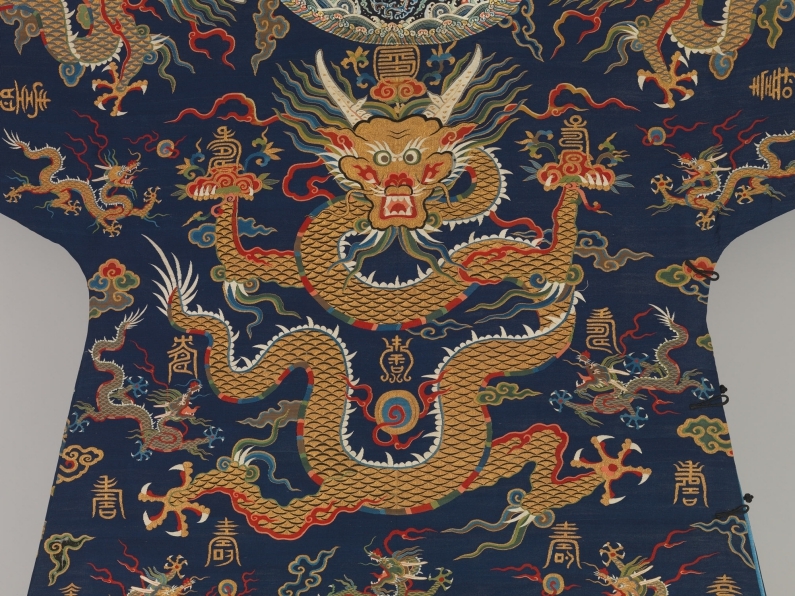 The deluge of Chinese textiles in the Beijing art market from the period of regime change in 1911 to the Japanese invasion in 1937 was staggering. Unlike Crofts or Krenz, who were well known to museums for their knowledge and expertise, Paul only came to attention of the Metropolitan Museum of Art after his will was probated in 1930. Paul obituary, The Otsego Farmer, Cooperstown, N. Y., Friday July 25, 1930, page 7, col. 6. This extended obituary provides most of the information we know about the life of William Christian Paul. His bequest of 1065 pieces of Chinese dress and fabric, according the Alan Priest the curator of the Asian Department, made “the Metropolitan Museum of Art collection of Chinese textiles the best in any museum in the world, with the exception of the Imperial Palace Museum of Peking [sic],…” (Alan Priest, “The William Christian Paul Bequest of Chinese Textiles,” in Bulletin of the Metropolitan Museum of Art, July, 1930, vol. XXV, no. 7, p. 162). Hyperbole aside, it was, and is, a remarkable holding to have existed largely under the radar through out the early decades of the 10th century. 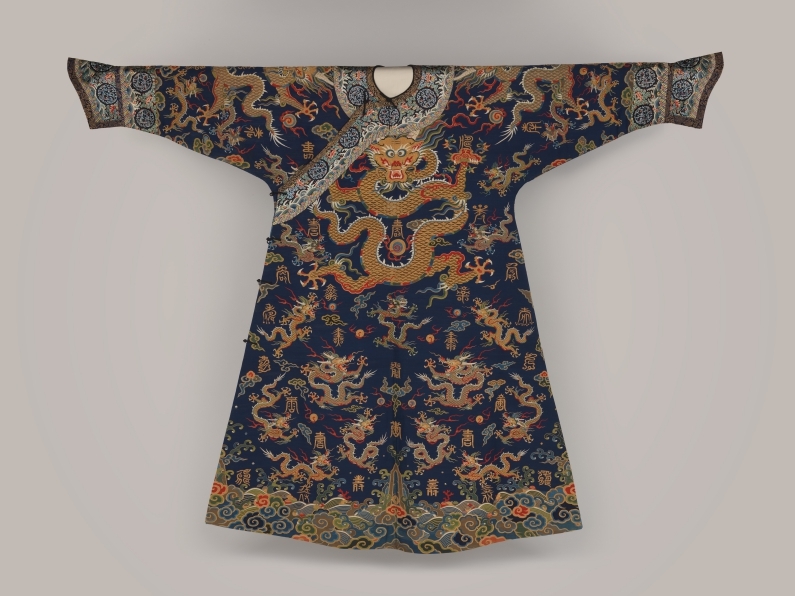 The collection includes significant examples of imperial court textiles including a rare silk and gold tapestry woven (kesi) robe of late 17th or early 18th century date. Originally made to celebrate an imperial birthday, it remains an outstanding treasure of the Metropolitan Museum of Art. Imperial court robe, silk and gold-wrapped thread tapestry (kesi), Qing dynasty, 17th century (with added early 18th century cuffs and facings), 55.98 in. (142.2 cm), © Metropolitan Museum of Art, Bequest of William Christian Paul, 1929 (30.75.5). 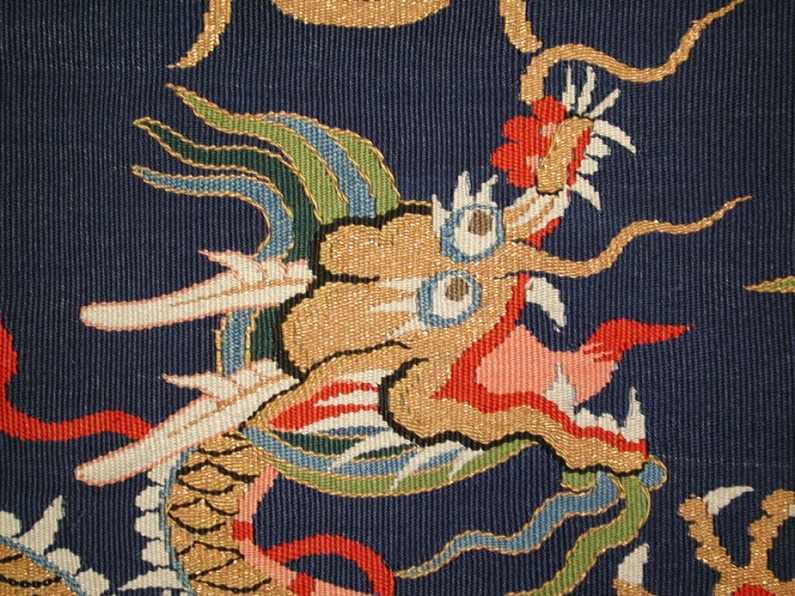 Detail of the back of an imperial court robe. © Metropolitan Museum of Art, Bequest of William Christian Paul, 1929 (30.75.5). Detail, imperial court robe. © Metropolitan Museum of Art, Bequest of William Christian Paul, 1929 (30.75.5). 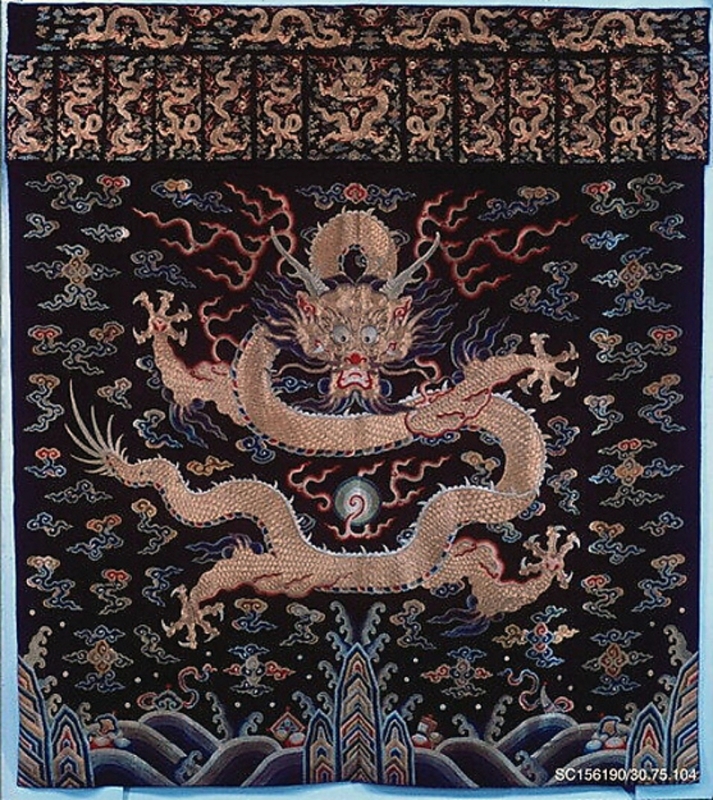 A cloth of state for a male relative of the emperor is emblazoned with a five clawed dragon. Hanging, silk satin, embroidered with floss silk and gold-wrapped threads, Qing dynasty (18th century), 92 1/2 x 81in. (235 x 205.7cm). © Metropolitan Museum of Art, Bequest of William Christian Paul, 1929 (30.75.104). A particularly refined rank badge (buzi) for civil official is embellished with fresh water pearls, which were especially valued by the Manchu court as tokens of their original homeland along the Amur River. Spectacularly large pearls were reserved exclusively by the emperor. Small seed pearls, although costly, were occasionally used by less grand courtiers. 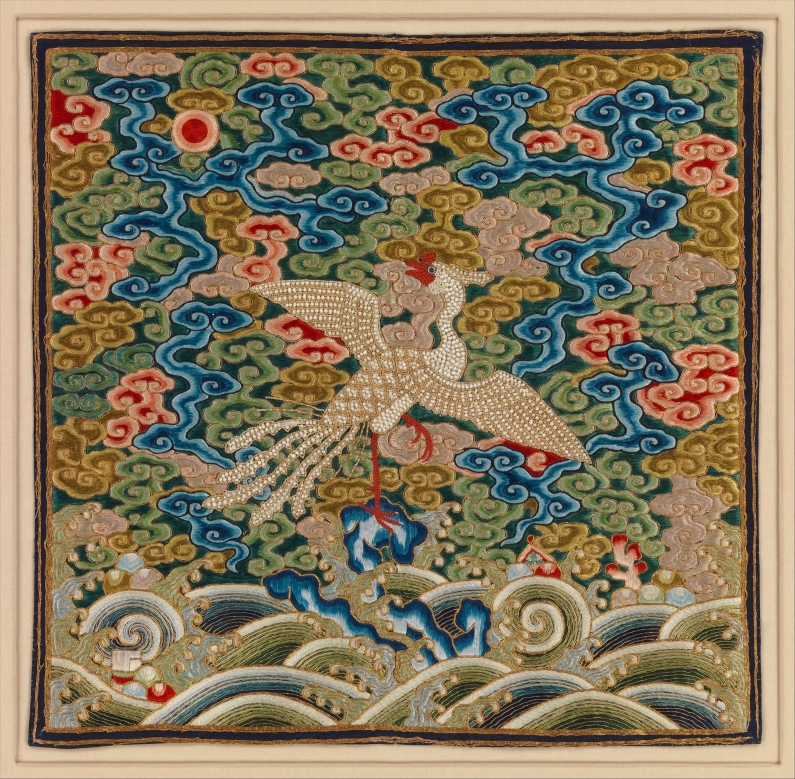 Rank badge (buzi) with silver pheasant (for fifth rank civil official), silk satin embroidered with floss silk and gold-wrapped thread applied fresh water pearls, Qing dynasty, mid-18th century. 10 1/4 x 10 1/2 in. (26 x 26.7 cm). © Metropolitan Museum of Art, Bequest of William Christian Paul, 1929 (30.75.899). William Christian Paul was born in Albany, New York in 1871, one of five boys. The family moved to the small city of Oneonta, in central New York. He learned telegraphy and worked in the railroad offices there. In 1896-99 he travelled to Alaska to join the Klondike Gold Rush. He obviously did not strike it rich; but in 1908 made a “health trip” around the world, at which time he became interested in collecting. We might assume Beijing was on the itinerary and that he may have visited the various markets for art or used clothing that had begun to flourish in China as the Qing dynasty was collapsing. There is no explanation as to why he was attracted to Chinese dress and fabrics. Paul’s collection reveals a broad interest in Chinese textiles and a taste for superlative technique in weaving and embroidery. 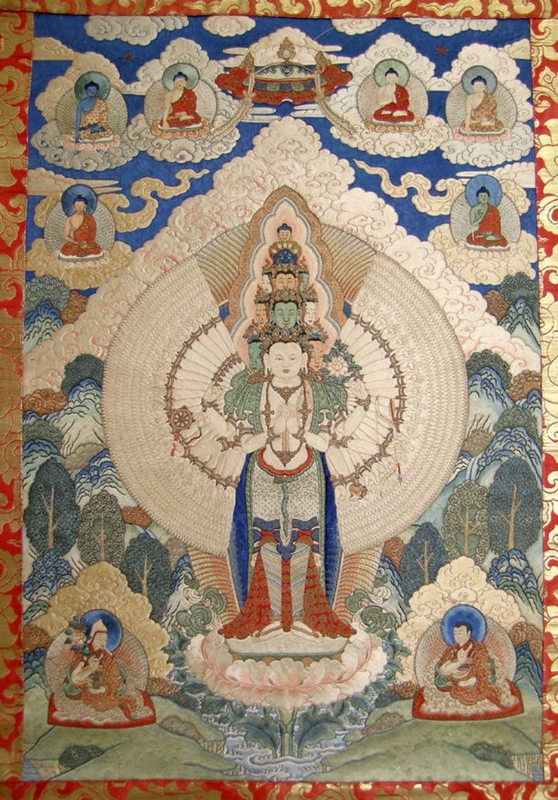 An imperial embroidered thangka is dated 1778. Eleven-faced Guanyin hanging (thangka), silk tabby embroidered with floss silk and gold-wrapped threads, mounted with silk brocade, lined with silk, Qing dynasty, dated by inscription to 1778, 101 1/2 x 1 3/4 in. (257.8 x 4.4 cm). © Metropolitan Museum of Art, Bequest of William Christian Paul, 1929 (30.75.34b). The bulk of the collection consists of accessories for the hand and for garments that exhibit exquisite needlework. Pair of woman’s sleeve turn backs, silk satin embroidery with floss silk and metallic threads, Qing dynasty, 19th century, each 40 x 3 in. 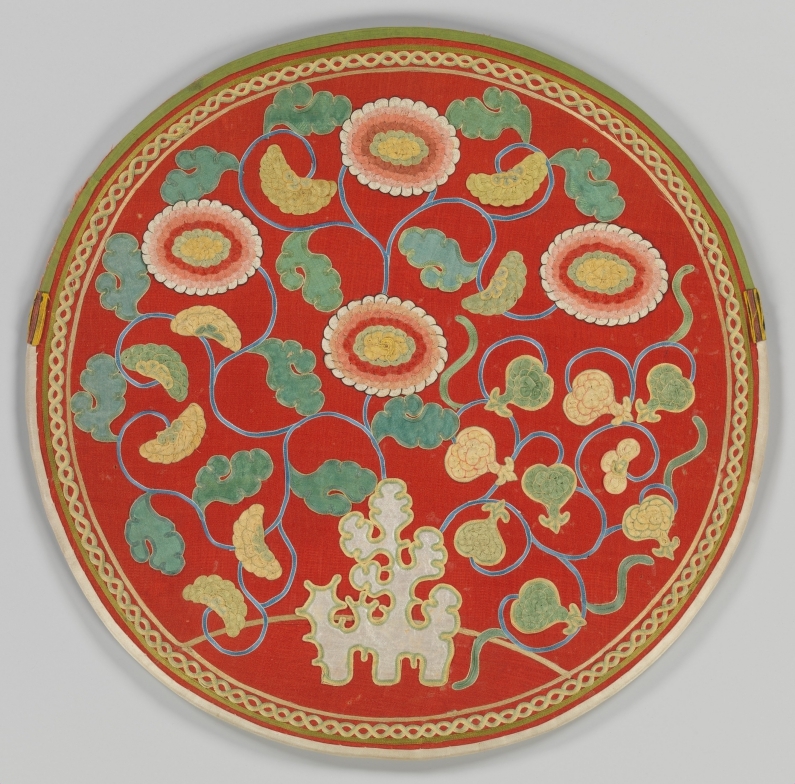 Mirror case, plain silk tabby (crepe), with silk tabby appliques and applied silk plated braid, Qing dynasty, 18th century, 14 1/2 x 14 1/2 in. (36.8 x 36.8 cm). © Metropolitan Museum of Art, Bequest of William Christian Paul, 1929 (30.75.62). Folding fan case, silk and gold-wrapped thread tapestry weave (kesi), Qing dynasty, late 18th – 19th century, 12 1/4 x 2 1/2 in. (31.1 x 6.4 cm). © Metropolitan Museum of Art, Bequest of William Christian Paul, 1929 (30.75.831). William Paul never married and for many years lived with a brother in Mount Vernon, New York, north of the city. He was employed in the applications bureau of the Metropolitan Life Insurance Company in New York City for nearly 20 years. But on his own time William became a connoisseur and expert in Chinese textile arts, expending most of his income acquiring beautiful textiles and studying them at night and when he was not at his office job. There is no record of the sources for Paul’s collection. He may have acquired some pieces in Asia, but most probably pieces came through New York sources, such as Yamanaka & Company at 680 Fifth Avenue and the auction at American Art Association Galleries on Madison Avenue at 56th Street and The Anderson Galleries on Park Avenue at 59th Street. 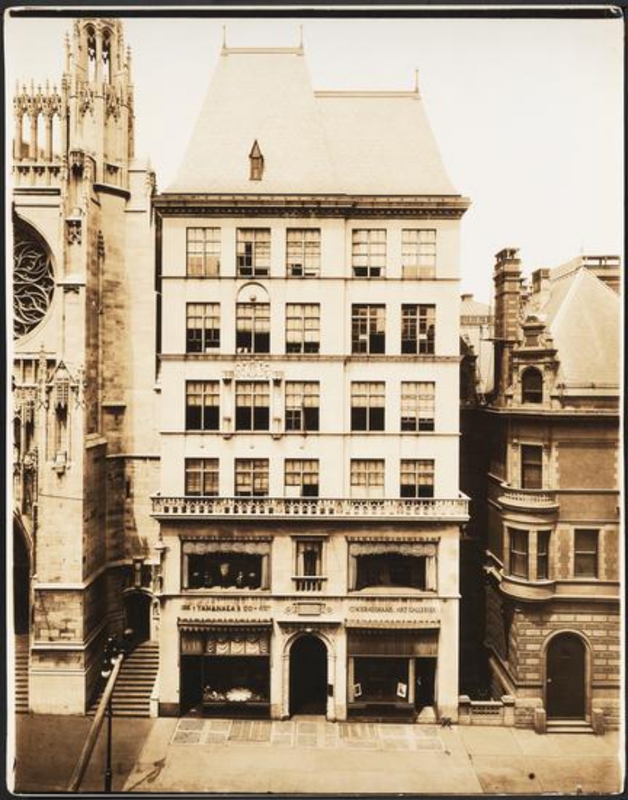 680 Fifth Avenue, Commercial Building, Yamanaka & Co, C.W. Kraushaar Art Galleries, 1916-1936, gelatin silver print, 14 x 11 in (35.56 x 27.94 cm). © Museum of City of New York, X2010.7.2.24309. 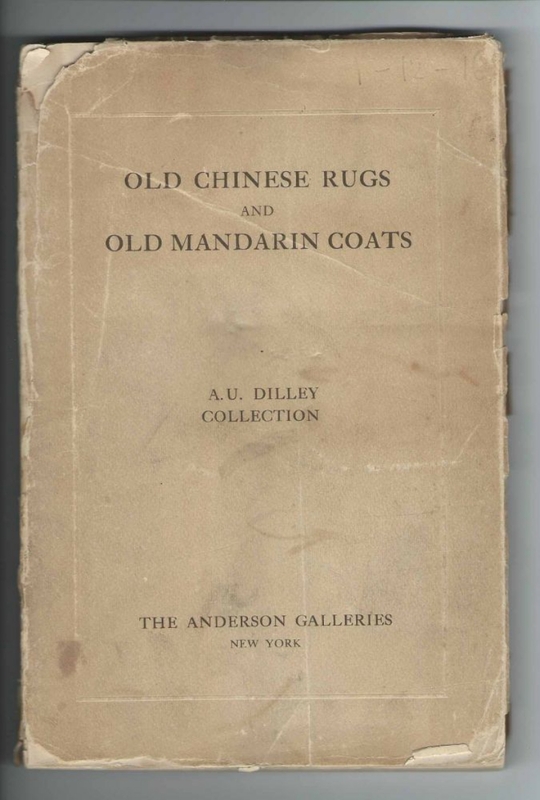 The Anderson Galleries, Old Chinese Rugs and Old Mandarin Coats from the Collection of Arthur Urbane Dilley catalogue, 1916, 9 x 6 in (22.86 x 15.24 cm). © Courtesy RugBooks.com | Dennis and Wesley Marquand. William Paul died in Manhattan, New York 12 January 1929 at age 58.